Every loss at the Sanctuary is difficult, but when it’s a sudden and unexpected loss, the pain cuts a little deeper. We never thought we’d be saying good-bye to active 14-year-old Matty the cougar so soon. 14 might be considered geriatric, but is very young for our residents who often live close to 20 years or beyond. Matty left us due to acute renal failure just like her parent’s Mia and Max did a few years ago. Within just 3 days, she was a happy, healthy girl…and then she was gone. There’s a big hole in all our hearts right now and still some disbelief. If you met Matty, you know why. She was one of our most active cats at the sanctuary. 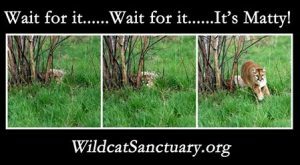 She never missed a moment to play with the ‘5 Wild’ along the fence line, play hide and stalk from the tall grass with her caregivers and then pop up purring as loud as could be. It was rare to see her sitting still or just basking in the sun – she liked to be on the move and in the middle of all the sanctuary happenings. As calm and cool as tiger Zeus and cougar Max were, Matty was just the opposite. She was a party animal. Full of energy and life. Taking on every piece of enrichment she was given – and she always won. Jumping to the tallest perch before launching off and on to her next adventure. She came to us in 2006 with several other cats when the Catskill Game Farm in New York closed. But boy, does it seem like just yesterday. 12 years later and she hadn’t aged a bit, at least on the outside. She remained in good spirits even after the passing of her parents. Nothing seemed to get Matty down. I’m happy she didn’t have more than a few bad days on this earth, but her loss does take our breath away. In rescue, we’re always providing comfort care to our elder residents and those that just can’t beat the odds of the health problems they have from their past. So we sometimes can feel cats like Matty were cheated a little. And so were we. We didn’t know her time was coming so soon. Thank you for all the wonderful support. It really does help us through these tough times. We know you are hurting just like we are. And we know you will also be alongside us to welcome another cat in need after we grieve. Matty, you left us too fast! But then again, you were never a cat who moved slowly. We enjoyed every day and every moment with you. Thank you for always being such a happy and energetic presence here at the Sanctuary. The other side is very lucky to have you! 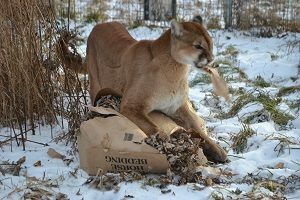 Matty, the cougar, along with six other cats were part of a big cat rescue from the Catskill Game Farm in New York in 2006. With the closing of their animal park, the game farm auctioned off 950 animals and made east coast and national headlines. Many worried that some of the animals would wind up in the hands of unscrupulous dealers, or to people who run ‘canned shoot’ operations, where hunters pay to shoot fenced-in animals. Wildlife Watch intervened and negotiated placement of animals in sanctuaries while others purchased animals to ensure their fate. It is described as one of the largest animal rescues of its type. 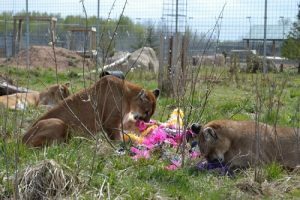 For many years, Matty lived with Max and Mia together in a large, free-roaming enclosure here at the sanctuary until Max and Mia both passed away. 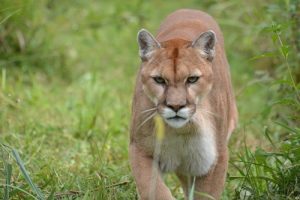 Matty is very active and interested in what’s going on around her – especially in what all her cougar neighbors are up to. She loves to crouch low and stalk anyone passing by her habitat. She also lets loose a fearsome cry every mealtime, reminding us daily that these cougars will always be wild at heart.